I’m having a serious case of bird envy. It seems like everyone I know brags about all the beautiful birds frequenting their feeders. Their birds swirl around hungrily and pose (although not purposely) for photographs. Last year I bought a couple of feeders expecting to enjoy the red Cardinals, the Doves and other unknown (to me) varieties of birds that frequent the NW coast of Florida. Alas, an unexpected and certainly uninvited visitor raided the feeders. He and his brethren are bold, hungry, intelligent, crafty, and definitely a tribe of Wallenda’s. I call them tree rats but one in particular I call The Chunky Monkey. This winter the bird feeders were moved closer to the house, for two reasons. I wanted to take pictures of the Cardinals or whatever birds stay here in the cold and, what the heck, poor Essie the cat is without a TV in the sun room. She could watch the birds that flutter safely on the other side of the window and could imagine herself the big, furry hunter. But my plans were foiled. Mr. Chunky Monkey, an Olympic climber, easily scampered up the metal pole and wolfed down all the bird seed in the plastic feeders. Sunflower seeds must be a squirrel’s version of chocolate, I’m guessing. I own and train Border Collies so playing one-up games with animals is normal for me. Bring it on, squirrel, I chuckled to myself. One day I saw a squirrel-proof bird feeder at a nearby Lowe’s. The biggest feeder was, of course, very expensive. My empirical research has led me to believe that Mr. Chunky Monkey is a member of Mensa. Would this feeder foil him? Feeling somewhat doubtful in spite of the circled picture of a squirrel with a red line through it shown on the box, I bought a smaller version, took it home, filled it up with sunflower seeds and sat back to watch the birds. Sweet. Finally. This is going to be great. Pffft. Now both the Border Collies AND The Chunky Monkey are laughing at me. 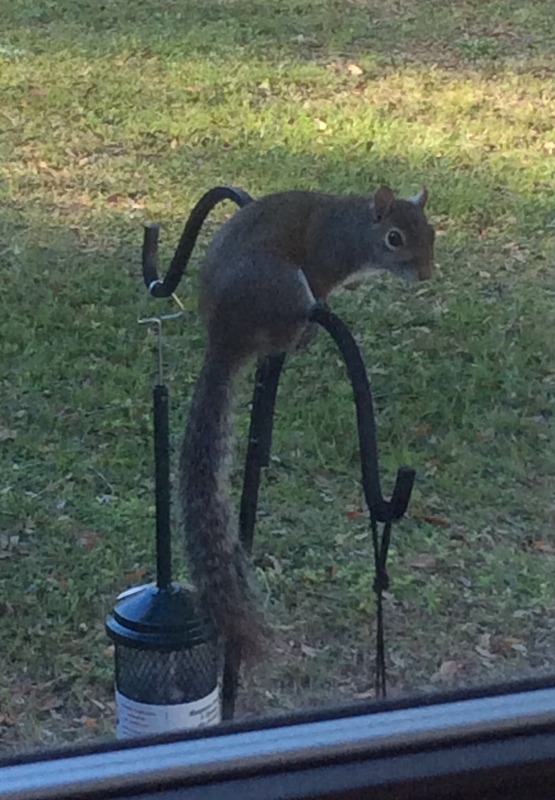 The big fat squirrel climbed up the pole and examined the new feeder. He stepped on the little metal steps, which closed the feeder. He climbed on top of the pole contemplating his next move. Then he used his tiny feet to hang onto the mesh feeder, leaned down and chowed down about two cups of sunflower seeds. I groaned. Foiled by The Chunky Monkey. I wondered if he wanted fries with that order of birdseed? Then the little twerp climbed up onto the top of the feeder, looked at me through the window and I swear, he laughed and raised his tiny paw, a certain digit clear as day. The next move is mine. The feeder is empty, no birds swoop down to even check for seeds. Why bother? Like me, they are losers in this game too. Just you wait, Chunky Monkey. I’m going to check the Internet and find a way to foil your buffet visits and then the birds can eat and I can watch them without you around. Pssst. Anyone have any ideas? This entry was posted in Birds, Retirement Life, Squirrels and tagged bird feeders, Birds, Border Collies, squirrel proof bird feeders. Bookmark the permalink. A large, clear plastic baffle shaped like a witch’s hat worked well for me when squirrels were a problem. From the top it’s all slippery downslopes. Chunky monkey… too funny of a name!! All of my feeders hang from trees via fishing line. In the 5 years I’ve had them like this, I have never seen one even try to get to it. Maybe they can’t see the thin line? They could possibly jump for them, as they are only about 3 feet from the trunk, but they don’t… Not sure why. I do feed them on the window sill. Maybe they are full from that? I also put out Suet and have multiple feeders scattered around to give the birds more opportunities to get their food. When all else fails Iet the border collies out to herd the squirrels. Actually the squirrels aren’t the number one offender, it is the starlings and blackbirds that totally consume everything in hordes..I let the dogs loose on them also!